Broadway Limited 3714 N Scale EMD SD40-2 NS #6159 Paragon3 Sound/DC/DCC. Let me know how many you want and I'll send an offer. If the picture doesn't match the title, then go with the title. If the Road number of a train does not match the title, then go with the title. If your completely unsure then contact me. Please don't assume anything. Example: if you're in a category for N Scale Locomotive and you don't see the scale in my listing then contact me. There is no guarantee that the locomotive is N Scale. If you are the slightest bit unsure please research it or contact me. DO NOT OPEN THE ITEM! If you open it I can't take it back since I won't be able to resell it. Customer ordered the Wrong product or just don't want it. Items must be in "new, unaltered and unused condition". Must be in original box unopened with no damage to the package or packaging including cellophane wrapping (we need to be able to resell that product as new). DO NOT OPEN THE ITEM IF YOU ARE GOING TO RETURN IT! That is 20% of the items price you paid. Wrong item sent or defective product. If we make a mistake by sending you the wrong item or you get a defective product we will make it right at no cost to you. 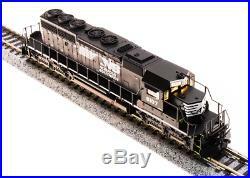 The item "Broadway Limited 3714 N Scale EMD SD40-2 NS #6159 Paragon3 Sound/DC/DCC" is in sale since Thursday, February 21, 2019. This item is in the category "Toys & Hobbies\Model Railroads & Trains\N Scale\Locomotives". The seller is "crazymodeltrains" and is located in Melbourne Beach, FL.. This item can be shipped to United States, Canada, United Kingdom, Denmark, Romania, Slovakia, Bulgaria, Czech republic, Finland, Hungary, Latvia, Lithuania, Malta, Estonia, Australia, Greece, Portugal, Cyprus, Slovenia, Japan, China, Sweden, South Korea, Indonesia, Taiwan, South africa, Thailand, Belgium, France, Hong Kong, Ireland, Netherlands, Poland, Spain, Italy, Germany, Austria, Bahamas, Israel, Mexico, New Zealand, Philippines, Singapore, Switzerland, Norway, Saudi arabia, Ukraine, United arab emirates, Qatar, Kuwait, Bahrain, Croatia, Malaysia, Brazil, Chile, Colombia, Costa rica, Dominican republic, Panama, Trinidad and tobago, Guatemala, El salvador, Honduras, Jamaica, Viet nam, Uruguay, Iceland, Sri lanka, Luxembourg.